Animation is a series of still drawings that, when viewed in rapid succession, gives the impression of a moving picture. The word animation derives from the Latin words anima meaning life, and animare meaning to breathe life into. Throughout history, people have employed various techniques to give the impression of moving pictures. Cave drawings depicted animals with their legs overlapping so that they appeared to be running. The properties of animation can be seen in Asian puppet shows, Greek bas-relief, Egyptian funeral paintings, medieval stained glass, and modern comic strips. In 1640, a Jesuit monk named Althanasius Kircher invented a "magic lantern" that projected enlarged drawings on a wall. A fellow Jesuit, Gaspar Schott, developed this idea further by creating a straight strip of pictures, a sort of early filmstrip, that could be pulled across the lantern's lens. Schott further modified the lantern until it became a revolving disk. A century later, in 1736, a Dutch scientist named Pieter Van Musschenbroek created a series of drawings of windmill vanes that, when projected in rapid succession, gave the illusion of the windmill circling around and around. The magic lantern became a popular form of entertainment. Traveling entertainers, visiting the villages and towns of Europe, included it in their shows. In London, the Swiss-born physician and scholar Peter Mark Roget, most famous for compiling the Thesaurus of English Words and Phrases, was fascinated by the scientific phenomenon at play and wrote an essay entitled "Persistence of Vision with Regard to Moving Objects" that was widely read and used as a basis for subsequent inventions. One of the first was the thaumatrope, developed in the 1820s by John Paris, also an English doctor. The thaumatrope was simply a small disk with a different image drawn on either side. Strings were knotted onto two edges so that the disk could be spun. As the disk twirled around, the two images appeared to blend. For example, a monkey on one side appeared to sit inside the cage on the opposite side. The next major innovation was the phenakistoscope, created by Joseph Plateau, a Belgian physicist and doctor. Plateau's contribution was a flat disk perforated with evenly spaced slots. Figures were drawn around the edges, depicting successive movements. A stick attached to the back allowed the disk to be held at eye level in front of a mirror. The viewer then spun the disk and watched the reflection of the figures pass through the slits, once again giving the illusion of movement. In Austria, Simon Ritter von Stampfer was toying with the same idea and called his invention a stroboscope. A number of other scopes followed, culminating in the zoetrope, created by William Homer. The zoetrope was a drum-shaped cylinder that was open at the top with slits placed at regularly spaced intervals. A paper strip with a series of drawings could be inserted inside the drum, so that when it was spun the images appeared to move. By 1845, Baron Franz von Uchatius invented the first movie projector. Images painted on glass were passed in front of the projected light. Forty-three years later, George Eastman introduced celluloid film, a strip of cellulose acetate coated with a light-sensitive emulsion that retained and projected images better than those painted on glass. The first animated cartoon Humorous Phases of Funny Faces by J. Stuart Blackton, of the New York Evening World, was shown in the United States in 1906. Two years later, French animator Emile Cohl followed suit with Phantasmagorie. Winsor McCay introduced Gertie the Dinosaur in 1911. Other cartoonists who brought their characters to the screen included George McManus (Maggie and Jiggs) and Max Fleischer (Betty Boop and Popeye). By 1923, Walt Disney, the world's most famous animator, began turning children's stories into animated cartoons. Mickey Mouse was introduced in Steamboat Willie in 1928. Disney's first animated full-length film, Snow White and the Seven Dwarfs, debuted in 1937. Yellow Submarine, a 1968 animated film starring the Beatles, featured the process of pixilation, in which live people are photographed in stop-motion to give the illusion of humanly-impossible movements. In the film The Lord of the Rings, directed in 1978 by Ralph Bakshi using rotoscoping, live action was filmed first. Then each frame was traced and colored to create a series of animation cels. By the late twentieth century, many in the industry were experimenting with computer technology to create animation. In 1995, John Lassiter directed Toy Story, the first feature film created entirely with computer animation. Although the most important raw material in creating animation is the imagination of the animator, a number of supplies are necessary to bring that imagination to life. Sometimes these items are purchased; sometimes they are constructed by the animator. The animator works at an animation stand, a structure that holds a baseboard on which the drawings are attached by register pegs. 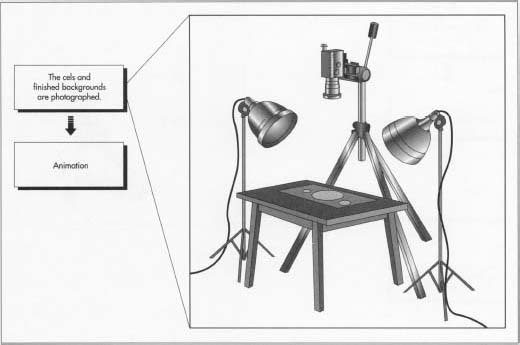 The animation stand also supports a camera, lights, a work surface, and a platen (clear sheet of glass or plexiglass that holds the drawings in place). The drawings are executed on cels, drawing paper, or on film. The majority of professional animation is drawn on cels, transparent acetate sheets five millimeters thick. Each cel measures approximately 10 in by 12 in (25.4 cm by 30.5 cm). 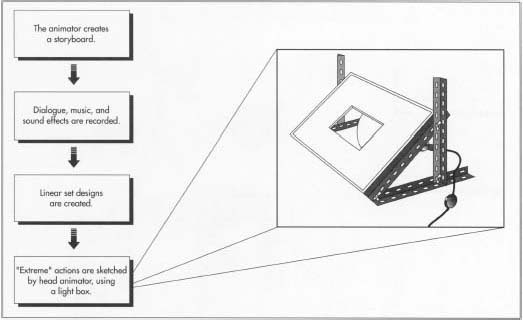 Holes are punched along the top edge of the cels, paper, or film, corresponding to the register pegs on the animation stand and baseboard. The pegs keep the drawing surface rigid. Opaque inks and paints, and transparent dyes are the most common media for drawing the story. Felt markers, crayons, and litho pencils can also be used. Professional animation is photographed with 35mm cameras. However, it is possible to use Super 8 or 16mm models. A variety of camera lenses are employed, including standard, zoom, telephoto, wide angle, and fish-eye lenses. Creating an animated short or full-length feature is a long, tedious process. Extremely labor-intensive, the average short cartoon has approximately 45,000 separate frames. To make a character say "Hello, Simon," can require 12 drawings to depict each movement of the character's lips. 1 Sometimes the animator is also the writer. The animator makes a storyboard, a series of one-panel sketches pinned on a board. Dialogue and/or action summaries are written under each sketch. The sketches may be rearranged several times as a result of discussions between the writer, the animator, and the director. "Mickey Mousing." Many professional studios now use an optical sound track on which voices, music, and sound effects are represented by varying lines. An electronic sound reader and synchronizer gives an accurate count of the number of frames required for each sound. 3 A technician known as a track reader measures each vowel and consonant in the dialogue. Words are recorded on exposure sheets (also called x-sheets or dope sheets), each of which represents a single film frame. This allows the animators to synchronize each movement of the character's lips with the dialogue. Footage, the time needed between lines of dialogue for the action to take place, is also charted on the exposure sheet. Slugs, or sections of film without sound, are inserted where the action occurs. 4 A model is created for each character in order to keep their appearances uniform throughout the film. The models can be detailed descriptions or sketches of the characters in various positions with various facial expressions. 5 A layout artist creates linear drawings that animators use as a guide for action and that the background artists use to paint the backgrounds. 6 Using the model sheets, the head animator sketches the primary, or "extreme," action. For example, if the character is running, the head animator will draw the foot leaving the floor, the foot in the air, and the foot returning to the floor. Or if the story calls for the character to blink, the head animator will sketch the eyes going through the motions. Animation assistants then fill in the details. paper is laid on top of the first and the second drawing is varied slightly to signify movement. 7 Artists check the characters against the model sheets. Drawings are enhanced but not altered. Scenes are checked to ensure that all action called for on the exposure sheet is included. All figures are checked for proper line-up with the background. 8 A computerized videotape is made of the sketches to check for smoothness of motion and proper facial expressions. Adjustments are made until the desired effect is achieved. 9 Artists create color background paintings, including landscapes, scenery, buildings and interiors, from the pencil layouts. The color is filled in by computer. As the computer scans the layout, artists click on colors from a template. 10 If the animation drawings have been executed on paper, they are now transferred to cels using xerography, a process similar to photocopying. In a few studios, the inking is still done by hand, tracing the pencil sketches onto the cels. Colors are applied to the reverse side of the cel, usually by computer, in the same manner that background colors are applied. All inked and painted materials are checked several times for accuracy. 11 The cels and backgrounds are photographed according to the instructions on the exposure sheets. One scene of action can take several hours to photograph. The cels are laid on top of the backgrounds and photographed with a multiplane camera that is suspended high above. When more than one character appears in a frame, the number of cels stacked on top of the background increases. Each level is lit and staggered, creating the illusion of three-dimensional action. The film is sent to the photo lab where a print and a negative are made. 12 Dialogue, music, and sound effects are re-recorded from 10 or more separate tracks onto one balanced track. Another set of two tracks, one with dialogue and the other with music and sound effects, is often made to facilitate translation when the film is sent to foreign markets. 13 The final dubbing track is combined with the print to make a married print. If the animated film is for television viewing, the negative and the tracks are often sent to a video post-production house to be put on videotape. In the last decade of the twentieth century, computer-created animation began to make great strides. Although purists decry this development, it is unlikely that computer animation will disappear. What remains to be seen is whether or not traditional cel animation survives. Anime, a cartoon form from Japan, is also changing the nature of animation. Story lines and characters are more detailed and reality-based. Varied camera angles bring the viewer further into the action. Cawley, John and Jim Korkis. How to Create Animation. Pioneer Books, 1990. Locke, Lafe. Film Animation Techniques. Betterway Publications, 1992. Harmon, Amy. "Making a Face." Los Angeles Times, March 25, 1996, p. D-l.
Considine, J.D. "Toon in Tomorrow." The Baltimore Sun, April 14, 1996, p. 1H. I need breaf explanation about starting creating my own animation and what kind of software are using?